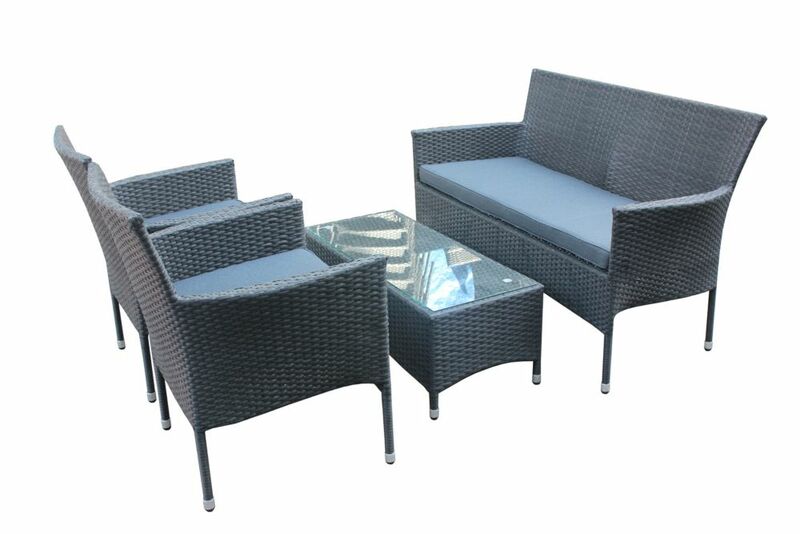 Relax and enjoy the outdoors with the Patioflare Lucus conversation set. The set is made of robust powder coated steel frame covered in beautiful hand woven matte black wicker which pairs wonderfully with grey cushions. The temepred glass table top is perfect for drinks and easy to clean. The Lucus includes two arm chairs, a loveseat and a coffee table. Chair: 25.6" x 25.6" x 33.46" Bench: 25.59" x 50.78" x 33.46" Table: 37.8" x 18.11" x 15.75"
Lucus Patio Chat Set in Matte Black Wicker with Dark Grey Cushions Relax and enjoy the outdoors with the Patioflare Lucus conversation set. The set is made of robust powder coated steel frame covered in beautiful hand woven matte black wicker which pairs wonderfully with grey cushions. The temepred glass table top is perfect for drinks and easy to clean. The Lucus includes two arm chairs, a loveseat and a coffee table.